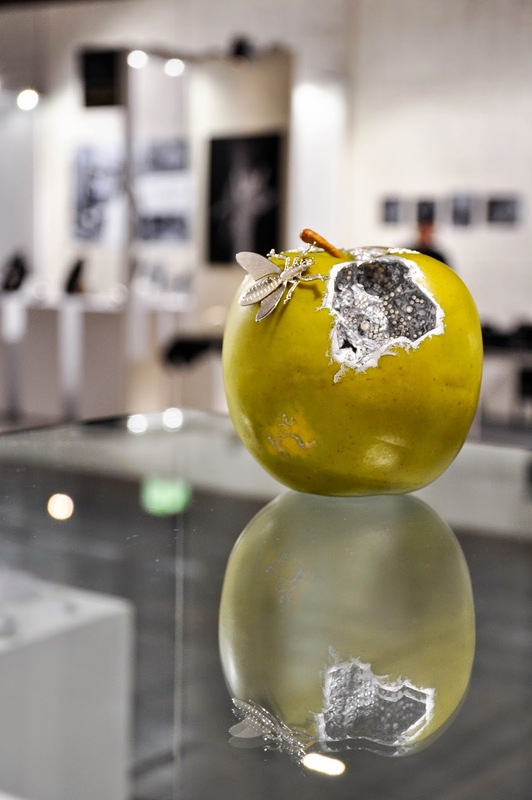 The apple is a work of art. For several minutes I simply can’t stop looking at it. The reality beyond it fades out of focus, the hubbub of people talking and walking from booth to booth momentarily stops. 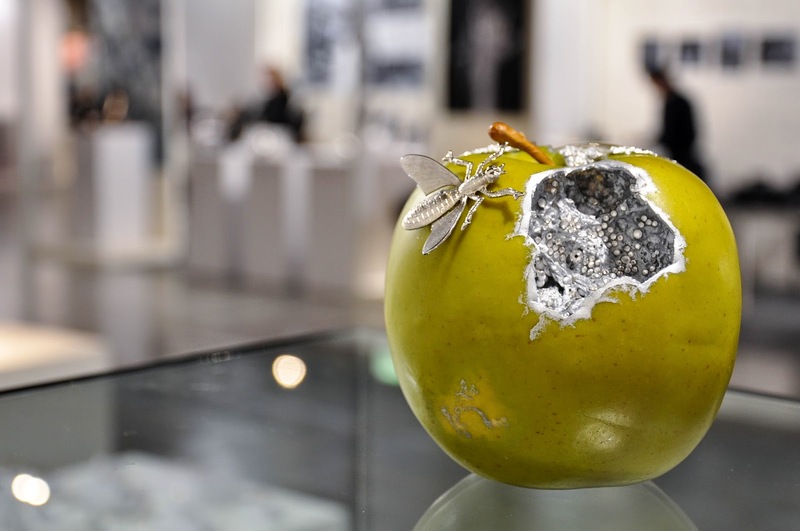 All I am interested in is this handmade jewel with its realistic apple surface and bite marks revealing the silver apple flesh set with sparkling stones. ‘It’s like there is a whole world inside it…’, says Antoaneta standing next to me. ‘Waiting to be discovered!’, I silently add. 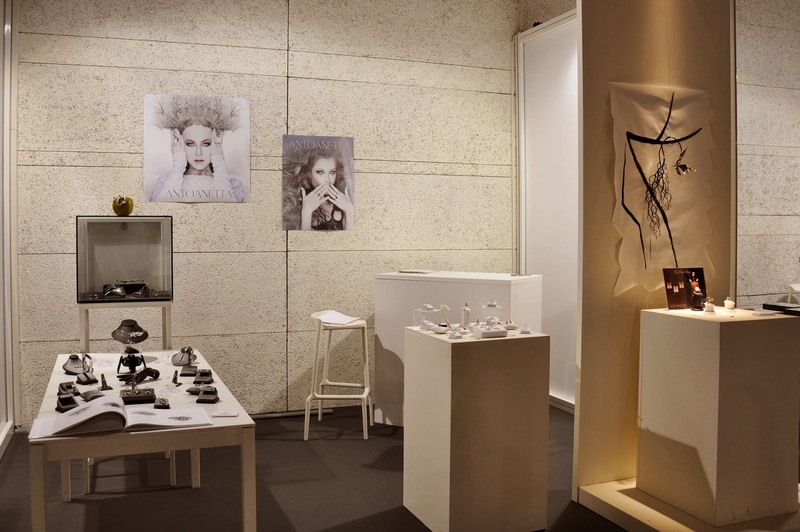 I met Antoaneta Ivanova at Origin Passion and Beliefs – an innovative fair in Vicenza – where independent style creators from all over the world exhibited over four days side by side with Italian fashion manufacturers. 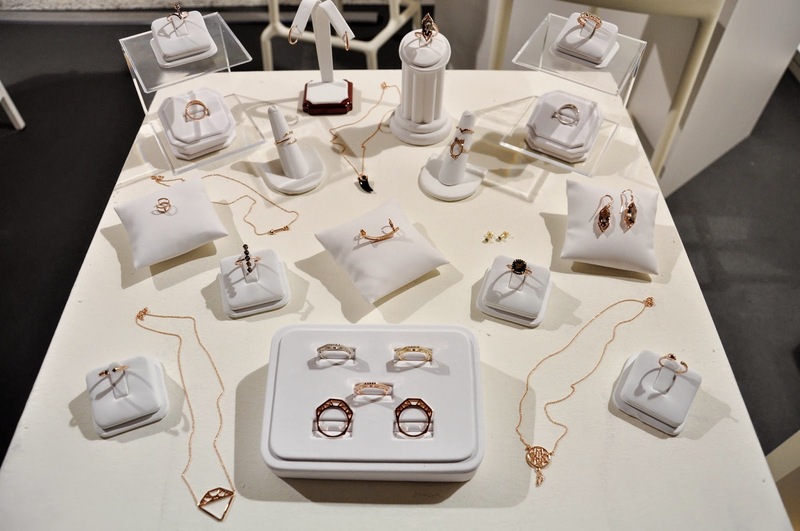 Antoaneta is a fine jewellery designer who had flown all the way from Los Angeles to showcase her latest collections and one-off pieces under her brand Antoanetta. Browsing through the exhibitors’ resumes prior to the fair, her work caught my eye. It was both soft and edgy with clean geometry and stripped down femininity. Her couture pieces feature in videos and photo shoots of big stars like Britney Spears, Taboo from The Black Eyed Peas and Bai Ling. Plus, as it turned out, Antoaneta is Bulgarian just like me. So, we arranged to meet. You know that feeling when you click with someone straightaway. You may have never met them before, but you feel so comfortable around them that you can be simply yourself. The world of fine jewellery can be quite elitist with the sparkle of diamonds and precious metals creating an aura of exclusivity around it. Sometimes it is scary being an outsider in it. With Antoaneta I feel at ease. and shows me her new jewellery collections. Cyberia – a clever play on ‘cyber’ and ‘Siberia’ – is futuristic and minimal with bold geometric shapes. The pieces remind me of patterns in fractured ice. They are beautiful and very memorable. Black Rose is a style-forward combination of rose gold and black diamonds with carefully thought-out designs which are minimal in size, but with a strong look on the hand and around the neck. 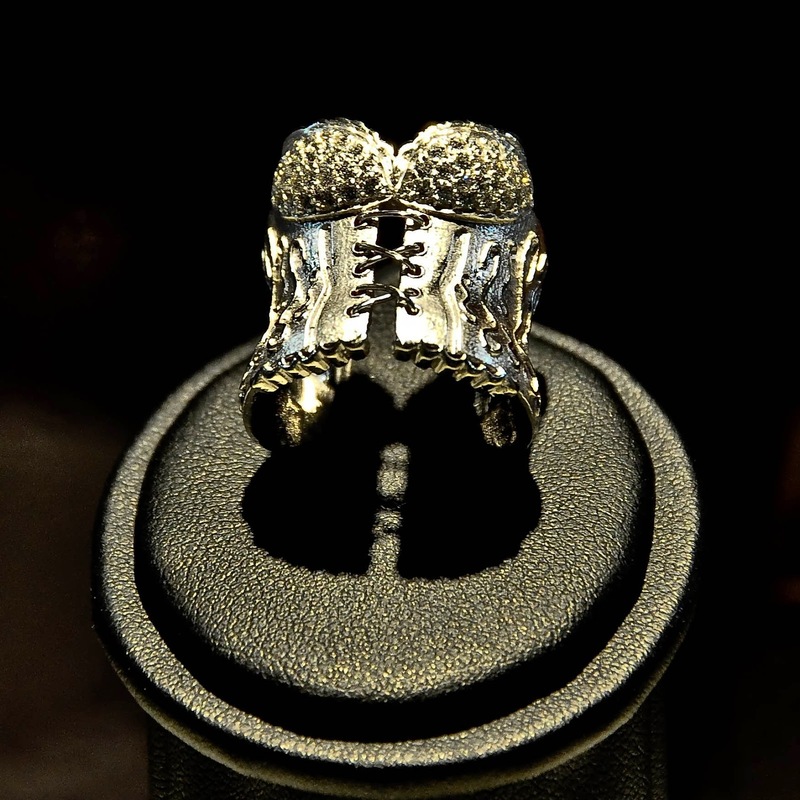 Then my attention is grabbed by the Corset Ring with its textured feel and perfect detail. I spend a long time trying to take a photo of it under the bright lights. All the while Antoaneta and I talk animatedly about her flight from LA to Italy, why I have moved to Vicenza, our memories of Bulgaria and all the thousand little things about our respective lives which we can’t wait to put in words so as to establish a quick rapport. 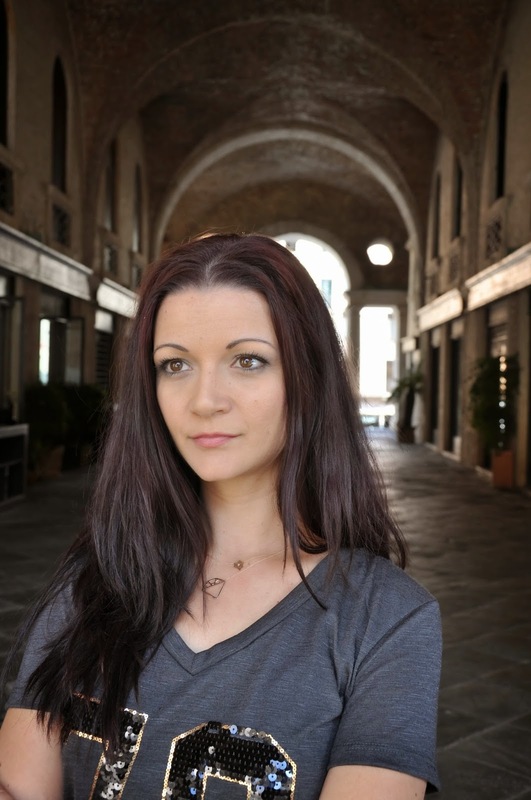 Born in Bulgaria, Antoaneta is a graduate of the prestigious Gemological Institute of America and has lived in several countries spending the last 15 years in LA. This gives her a cosmopolitan perception of the world and an intimate knowledge of both Eastern and Western Europe and the US. 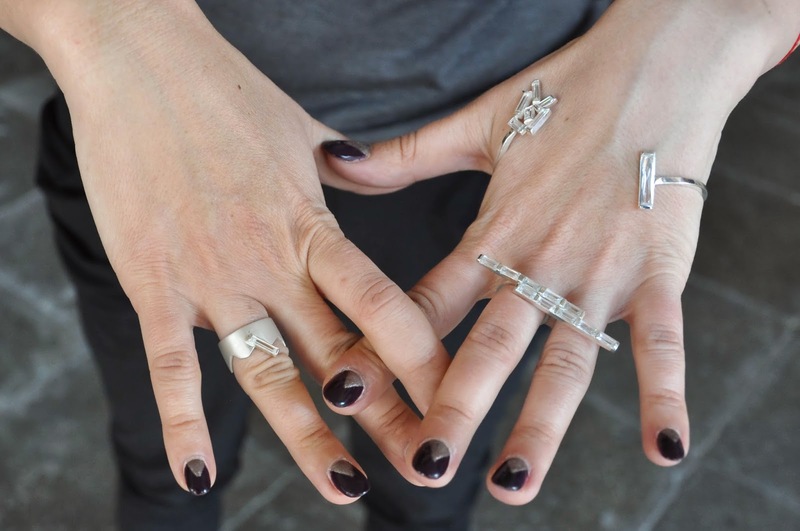 She tells me about her father – a jeweller, too – who cultivated her love for jewellery and introduced her to its ability to tell a story and to influence its wearer. 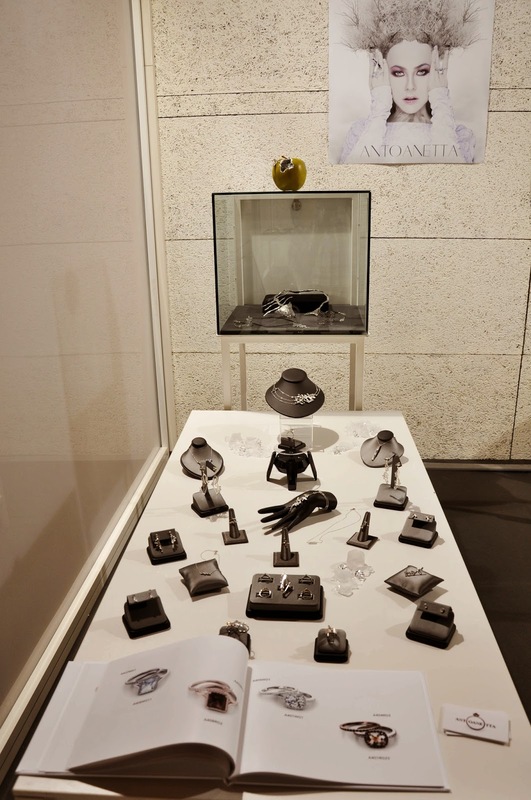 ‘It’s difficult for me to pinpoint when I started making jewellery’, tells me Antoaneta, ‘as I was brought up with it!’. 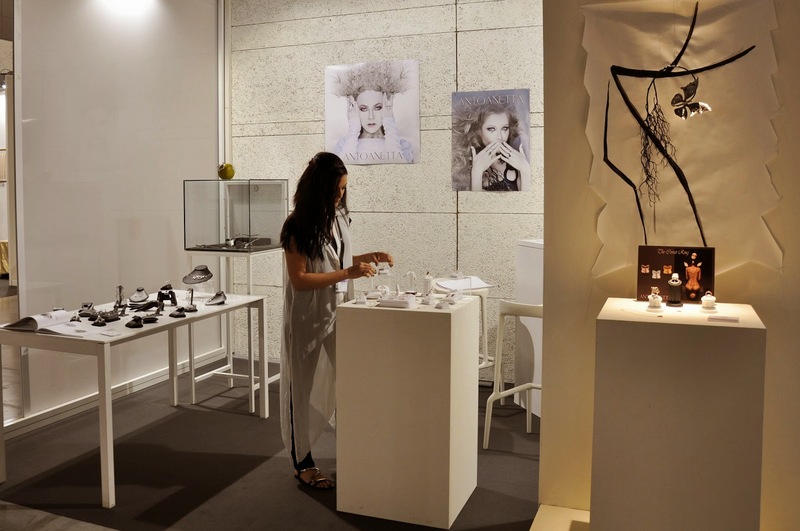 She makes to adjust a necklace on one of the displays and tells me about the evolution of her jewellery-making style. ‘Now it’s all about smooth clean lines, before I used to do lots of reticulated* pieces like that necklace’, she says and points to a heavy silver piece shaped like a fish bone. 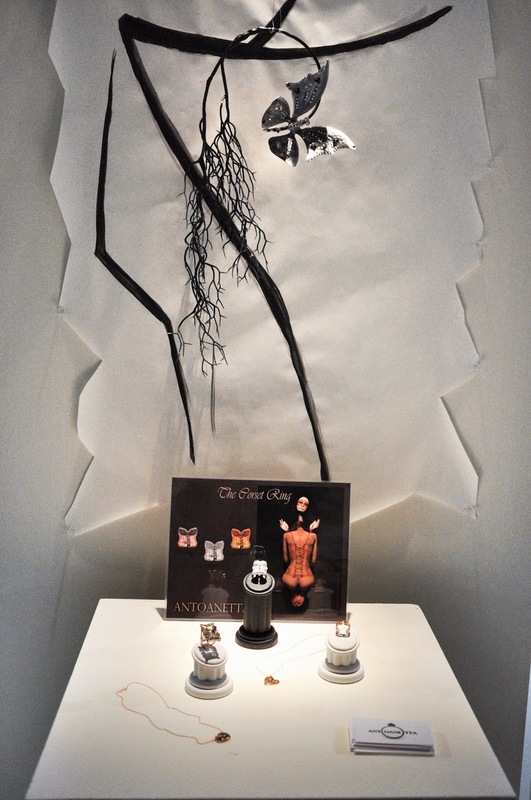 It is only afterwards, when I peruse her site – antoanetta.com – that it strikes me that this is the exact necklace which Britney Spears wears in her video ‘Piece of Me’. Oh, gosh! I missed my chance to touch a piece of pop history! Time flies too quickly, so Antoaneta and I arrange to meet for coffee after the fair concludes, so that I can show her Italy’s only Jewellery Museum and then continue our chat. When we meet on Monday Antoaneta is full with emotions after four days spent meeting jewellery aficionados and professionals at the fair. We head for the Jewellery Museum and slowly explore its nine rooms. It is great being there with an expert like her as I learn several new things and she also points some jewellery pieces to me which otherwise I would have simply walked past. We stop in front of a stunning emerald necklace and as a gemologist Antoaneta explains to me how coloured stones are appraised. It turns out that in terms of coloured stones what matters the most is their colour and how unique it is. As such, if the colour is rare and/or intense the stone’s value may be really high even if the stone has inclusions in it. When we come across a stunning string of pearls, she tells me about her appreciation of them and explains how difficult it is to compile a string with perfectly matched pearls in terms of their lustre, uniform size, colour and orient. She stops in front of a necklace made of rose gold and when I ask her why she has chosen to work with this metal in combination with black diamonds for her collection Black Rose, she explains that she was attracted by the delicate womanly nature of the rose gold and the way the black diamonds give the designs a definite edginess. 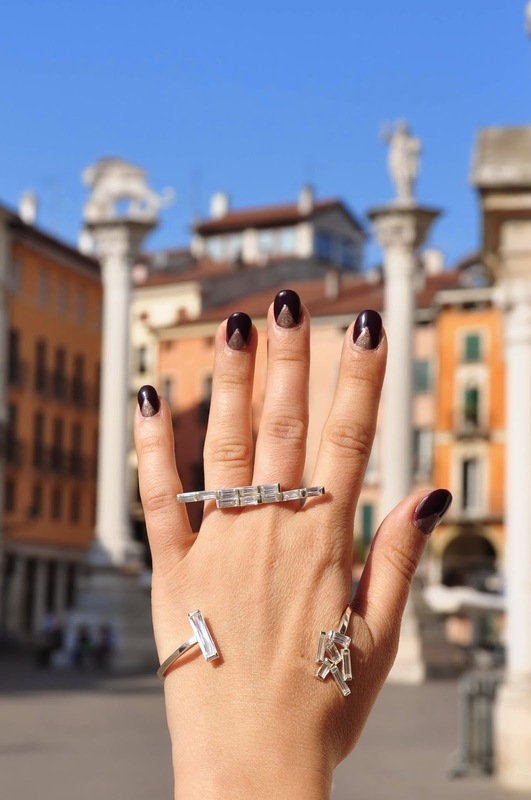 With the visit to the museum ticked off, we spend some time at Piazza dei Signori – the main square in Vicenza – taking photos of Antoaneta and her bejewelled hands for this blog post. A special mention should be reserved for her palm bracelet – a still new jewellery concept which I would love to see gaining bigger popularity in Europe. We have a lot of fun styling the modern jewellery against the historical backdrop of the centuries-old Church of San Vincenzo. Then against one of the columns of Palladio’s Basilica. And finally against the pillars at the end of the square. We chat about Antoaneta’s work with the stars and their stylists in LA. 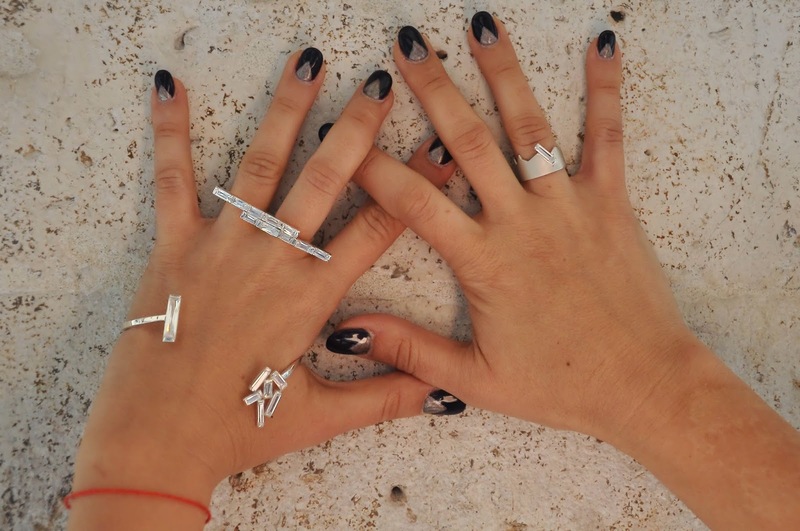 About her need to create new designs without setting any boundaries for herself and her jewellery. All the while I admire the micro black diamonds set on the edge of her diamond-shaped pendant. They sparkle and make the whole design come to life. It is a fabulous feeling when you meet people who inspire you and whose work you admire as it opens new horizons in front of your eyes. Just like the jewellery apple at the start of this post, they nurture a whole new world inside themselves. * Reticulation is a jewellery technique where the jeweller heats up the surface of a metal sheet with torch until it starts to bubble and forms a uniquely patterned texture.